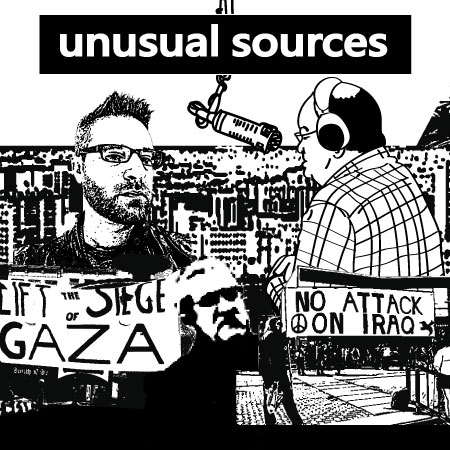 Unusual Sources goes beyond the corporate media to deliver the less-heard stories about events in Israel/Palestine, Latin America, and other sites of struggle. We bring you the news about ordinary people’s efforts to build a better world, whether in unions, movements, or political parties. Our labour-friendly coverage has spanned more than a decade. Unusual Sources was born out of opposition to the George Bush years of war and occupation. These policies have unfortunately continued under successive governments, in Canada and the U.S., and we cover them here. Join us in our fight against racism and war, for a just world where ordinary people choose their own destiny. In a time when powerful corporate interests are trying to regulate the news and information that reaches you, our independent media programming is more important than ever before.